What is Australis? - Australis is a fairly radical redesign of Firefox that makes its first appearance in Firefox version 29. The redesign is far reaching and changes not only Firefox's appearance, but also some features and functionality. In addition to the obvious appearance UI changes that can be seen, certain features have been removed, some locked into fixed positions and other new features added and a list of all is given below. Probably the most important new feature that has been introduced is that of the new Menu Button. Whilst the 'old style' menu still exists on the Menubar (which may be hidden, but can be toggled back on) the text based App Menu button (the orange button in the top left) has been replaced by a fully customizable icon based menu, which is to be found via the 3 line Menu button on the far right of the Nav Bar. The icons (buttons) that you see on that menu act like normal menu items (click the Addons button and the Addons Manager appears, just like you would do on a text based menu). But the key to understanding this new concept, lies in the bottom left of that menu and is marked 'Customize'. Once that is selected, additional toolbars can easily be selected, additional buttons can be added either to the toolbars (as you would expect) but also to the menu itself. 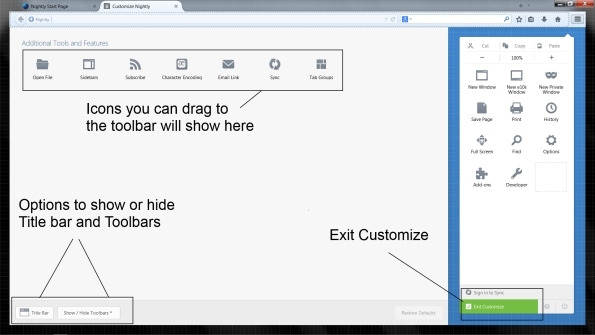 In addition, even the buttons on the menu can be moved to the toolbars as well or removed completely, if you want. This means, that apart from the limitations given in the list below, you can not only customize all of your toolbars, but also your menu as well and have only exactly what you want and need there. If you are used to touch screen icons, then this system will be pretty easy to adapt to, but if you are not then it may take a short while to 'get your head around' the general concept. 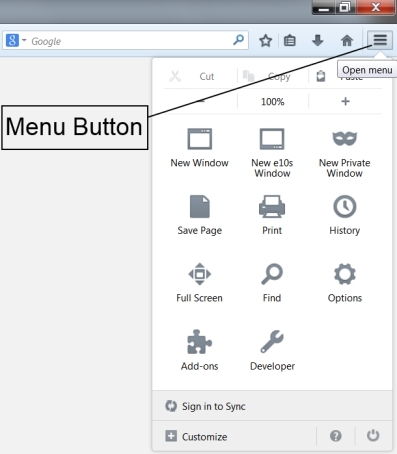 Until you do, it is suggested that you use both the new Menu Button (we call the Hamburger) and the conventional menu on the Menubar. As mentioned, certain features have been removed or locked into position. However, there are already a good number of Extensions and Complete Themes that will restore as many or as few features/functionality as suits your own particular requirements and a list of many of these is also provided below. Finally, many will like the new Australis redesign just as it is, many will not. If you are a 'not', just keep an open mind, check out the new Extensions and Themes for it and you might well find it is not all that bad after all. I hope you all enjoy using the new Firefox Australis. Please note, that if CTR is installed, you do not need the "Tabs on Bottom" extension, as it's included in CTR. If anyone finds new extensions that will help the transition please PM me no public discussion will be entered into. Last edited by malliz on January 15th, 2015, 6:18 pm, edited 10 times in total. Locking and Stick-ifying as this isn't really for discussion.